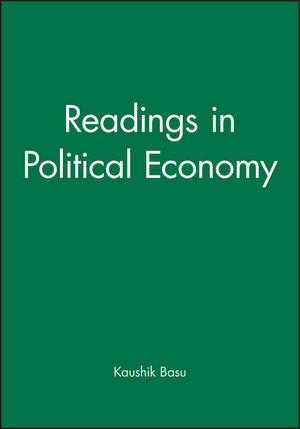 Ranging from authoritative seminal pieces to striking contemporary papers, the readings in this volume explore the complex intersections between politics and economics from the perspectives of both disciplines. Kaushik Basu is Professor of Economics and Carl Marks Professor of International Studies in the Economics Department at Cornell University. He is Editor of Social Choice and Welfare and Associate Editor of The Journal of Economic Perspectives and The Journal of Development Economics. He is author of many books and articles, including The Less Developed Economy, (Blackwell, 1984), Lectures in Industrial Organization Theory (Blackwell, 1993), and Analytical Development Economics (1997). 1. Extracts from Leviathan (1651) (Thomas Hobbes). 2. Of the First Principles of Government (1758) (David Hume). Part II: Institutions, Markets, and Political Power. 3. The Place of Institutions in the Economy: a Theoretical Perspective (1998) (Kenneth J. Arrow). 4. Transaction Cost Economics and Organization Theory (1996) (Oliver Williamson). 5. The Role of Institutions in the Revival of Trade: the Law Merchant, Private Judges, and the Champagne Fairs (1990)Paul R. Milgrom, Douglass C. North, and Barry R. Weingast). 6. Institutions and International Trade: Lessons from the Commercial Revolution (1992) (Avner Greif). 7. Implications from teh Disequilibrium of Majority Rule for the Study of Institutions (1980) (William H. Riker). Part III: Alternative Conceptions of the State. 8. The Coase Theorem and the Theory of the State (1973) (James M. Buchanan). 9. Dictatorship, Democracy, and Development (1993) (Mancur Olson). 10. Will Free Trade with Political Science Put Normative Economists out of Work (1997) (Brendan O'Flaherty and Jagdish Bhagwati). 11. On Misunderstanding Government: an Analysis of the Art of Policy Advice (1997) (Kaushik Basu). Part IV: Government and Agency. 12. Multitask Principal Agent Analyses: Incentive Contracts, Asset Ownership, and Job Design (1991) (Bengt Holmstrom and Paul R. Milgrom). 13. The Internal Organization of Government (1994) (Jean Tirole). 14. Power of Incentives in Private versus Public Organizations (1997), and extracts from The Making of Economic Policy (1996) (Avinash Dixit). Part V: The Political Process, Voting, and Public Choice. 15. The Statics and Dynamics of Party Ideologies (1957) (Anthony Downs). 16. Rationality and Social Choice (1995) (Amartya Sen). 17. An Economic Model of Representative Democracy (1997) (Timothy Besley and Stephen Coate). 18. Distributive Politics and Economic Growth (1994) (Alberto Alesina and Dani Rodrick). 19. Is Inequality Harmful for Growth (1994) (Torsten Persson and Guido Tabellini). 20. Social Norms and Economic Incentives in the Welfare State (1999) (Assar Lindbeck, Sten Nyberg, and Jorgen W. Weibull).